This is part 2 of my review of Lufthansa’s First Class service on the Boeing 747-8i between Frankfurt and New York. Part 1 of this review, which focused on the Lufthansa First Class seat, is here. 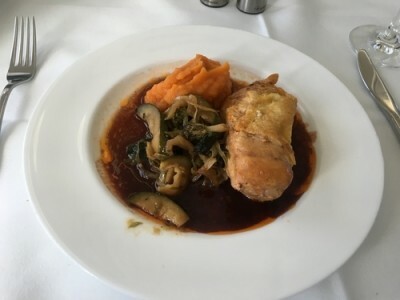 In this part I look at the impressive food served on board. You may well have read on Head for Points about how British Airways Club World will be adopting a trolley-based food service next year. 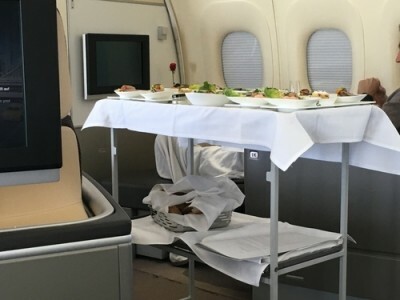 This is nothing new for Lufthansa, which has been offering a trolley based food service in First Class for many, many years. I think it is highly effective when the food is good. There is something triggered in the brain when faced with a trolley stacked with good looking meals and a need to make a choice. It looks like you pick one from five. In reality, everyone gets the caviar if they want it (and most do) and then any or all of the other four options can be taken from the trolley as you wish. Back in 2013, Lufthansa chief executive Carsten Spohr said in an interview with Canada’s Globe & Mail that Lufthansa buys 5% of the world’s caviar production making it the largest single purchaser. 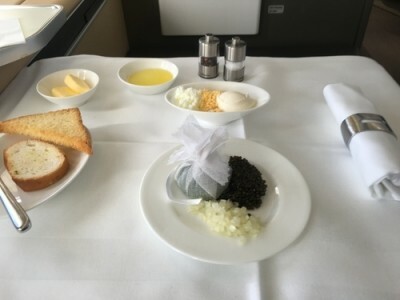 Lufthansa has scaled back the number of flights with First Class since then, but it will still be a major player in the world caviar market. If you stop to think about it, that is a massive commitment. 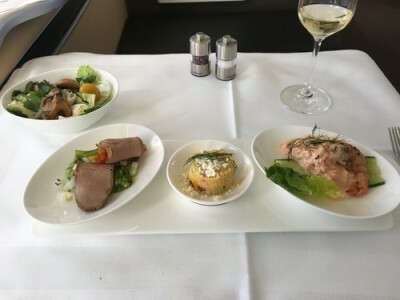 A handful of flights to and from Frankfurt and Munich, of which less than 2% of the passengers will be offered caviar, account for 5% of world demand. This was followed by a sorbet and sauce of apricot, flavoured with champagne upon your request. I requested. As New York is a fairly short flight, there is no formal second meal. 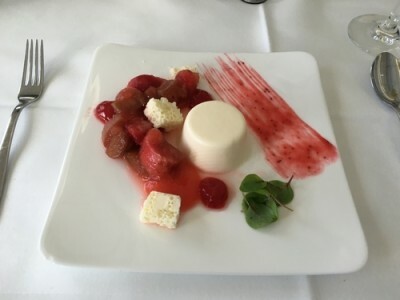 You can pick from a range of ‘light bites’ at any time, which included spuntino, three mini veal burgers, cold soup, gourmet salad or a variety of ‘sweet treats’. I decided to pass on this. By that point I’d already had breakfast in the BA lounge, a second breakfast on my BA flight to Frankfurt, lunch in the First Class Terminal and my second lunch on the plane. Even a ‘light bite’ seemed a bit too much! One little thing that made a big difference is that your tray table slides back a long way. Other carriers often make a simple mistake make. If you need to get up in the middle of your meal, it is simplicity itself. You don’t have to squeeze past your own table with the constant worry of sending your meal flying. I stuck with champagne all through the flight. However, Lufthansa First does have a decent wine selection, albeit not uniformly high end. The 2015 Life from Stone Sauvignon Blanc (South Africa) comes in at around £13 in the UK. A 2015 Adelaide Hills chardonnary (Australia) is hard to find but looks to be around £20-ish. There are also a couple of German options as you would expect – a riesling (Rothenberg 2014, tricky to but seems to be around £50) and a Keltic Terre white burgundy which appears very difficult to buy. The reds were a mix of German, Italian, American and Spanish. The Spanish (a rioja from Marques de Caceres) is only around £10+. The top option appeared to be the 2008 Chateau Latour Martillac which is over £30. Thre was also a German 2015 Huxelrebe Beerenauslese dessert wine. There is certainly a decent selection here and, if you know your wine, you could pass the flight very happily. In general, these are the bottles and vineyards which you will struggle to buy in the UK – which is good if you want something new, but bad if you find you really like it and want to buy more! The standard mix of premium spirits is available, including Johnnie Walker Blue Label. There are also four German beers you can try, including a ‘no alcohol’ one, plus seven different types of tea and a variety of coffees. Wi-fi is available but not free. Heaven knows why pretty much every airline expects First Class passengers to pay. A 1 hour pass costs €9, a 4 hour pass €14 and a full flight pass €17. I used it for an hour and it worked well, although you wouldn’t expect much trouble cross the Atlantic as you are not flying over any countries which impose a blackout. The IFE was acceptable, albeit nowhere near the scale of the Middle East carriers. There was a decent choice of current films and TV but it lacked the back catalogue depth that you might find elsewhere. You certainly wouldn’t struggle to find something suitable for your flight though. The crew were fantastic. There were two dedicated crew members for the First Class cabin, which had six seats filled out of eight. My understanding is that Lufthansa First Class crew work exclusively in that cabin and are trained specifically for it. This is totally different to the British Airways approach where the crew working in First Class will also work in other cabins on other flights. How can you fly this too? A one-way ticket from Frankfurt to New York costs 85,000 Miles & More miles and £261. It would cost the same number of miles to fly from London via Frankfurt but you would be faced with a substantial rise in the taxes due to long-haul UK Air Passenger Duty. I didn’t want to pay that. I got the majority of the miles via the Lufthansa UK credit card. The card is free and you earn 1.5 miles per £1 on the American Express and 0.75 miles per £1 on the Visa. There is a 33% bonus on all spending in your first six months. I got 15,000 miles for signing up (a special offer, it is usually 1,500) and then put a lot of tax – VAT, PAYE, personal tax – through the Visa whilst it was still in the ‘33% bonus’ phase. I was effectively buying miles for 0.38p each which was the credit card fee charged by the Revenue. I also pushed my Amex spending onto it during that period, earning 2 miles per £1. I topped up by converting some Heathrow Rewards points and some Starwood Preferred Guest points. As it is no longer possible to buy Miles & More miles, going via Starwood is one of the best options – you can even buy Starwood points and convert to Miles & More at a reasonable rate. With the bonus for a larger conversion, 20,000 Starwood Preferred Guest points would get you 25,000 Miles & More miles. Note that you cannot easily book Lufthansa First Class via Star Alliance partner airlines. Lufthansa negotiated an exception to the rules and only makes First Class seats available to partner airlines such as United, SAS or Singapore 14 days before departure. If you need to book with more advance notice, you will need to use Miles & More miles. You can then book at your leisure. Here is the short video I made during the flight if you didn’t watch it after reading Part 1. If you can’t see it, you can find it on our YouTube channel here. The Lufthansa website is here if you want to learn more about their service and route network. From memory I’m pretty sure you can move the ottoman closer – it’s part of the electronic seat control system on your armrest! yup, looks like 2K has actually done that in one of the pictures as well! Haha. In the aerospace industry we would call this a seat/aircraft interface failure! I was lucky enough to fly First Class in the A380 – at least there you can move the footrest nearer to your seat. Sitting at 1K, I had a “real” wardrobe right in front of me – row 2 had them in the back. Disappointing to learn that the seat plus bed arrangement has been scrapped, I had missed that news. That was why I wanted to fly OH again but I don’t think I’ll bother. Regarding the problem of light for reading, I wonder if there are any USB lights similar to keyboard lights that might be suitable and if they would allow us to use them. The keyboard light I had at one time was tiny so no hassle to carry them. The seat photo shows a light built in to the left side of the headrest, doesn’t it? I’ve never come across one yet that doesn’t but based on Ron’s comments in the article it would appear he prefers to have more light. Yes, Singapore Airlines first class still offers Salvatore Ferregamo scents in both the male and female amenity kits. The man in 1K looks like he is having a ct scan ! with wine and champagne, as with most things in life, greater price does not equal better…. Using your usual price yardstick, LGPS at c.£110 > Louise at £80? I had the BA one in my head at £60 ….. but you’re right. I was so certain I double checked the Dom price but not the LPGS. Dom used to be free flowing on Thai but then it disappeared, no idea if it has ever returned. One of my funniest flying memories was an elderly couple who could barely walk of the plane in Bangkok after celebrating all the way from London, I doubt they declined a single refill. It is usually about £110 but you can get it on offer from time to time at about £95. Cheapest I have got it this year was £90 and that was a combination of reduced price and a 2nd offer. That’s me done for the year though! Anika is doing all the other long haul stuff scheduled. How is availability for First redemptions on M+M? You need to be SEN/HON to book LX First on miles. LH First is for M&M members throughout the year open to book (though, awards especially to LAX and NYC are pretty hard to find). It’s also worth mentioning that a Senator or HON Circle member can book a Companion Award for the same flight for 50% fewer miles. A great benefit, IMHO, if you’re not travelling solo, obviously. True, forgot about that. I used that a couple of times when I last had LH status. OT: article in the FT titled “Virgin Money warns over areas of weakness in UK housing market” says near the end, after discussing their credit card business, that Virgin Money has struck a deal with Virgin Atlantic to become its UK financial services partner offering benefits like Flying Club miles. Could this be a reference to them taking over the VAA card offering from MBNA? Seems very likely, article on this tomorrow. My wife has a one-way to Dubai boooked on AB (and Qatar, but I don’t trust that so I’m holding AB to AUH as well!) for October. If I could pull this off at the last minute, and get the Avios back, it would be worth brownie points. Is there any online way to check Star First availability with Kris Flyer? If i remember correctly its not available through the Singapore booking engine. Nice review, Rob, thanks. Interesting re single zone for USA too – as you say not enough time for you on this trip but 85k in F to West Coast is pretty nice. PS good move switching off comments for part 1 so they’re all on part 2 – much easier to follow! +1 Much easier to follow. It was a mistake actually. Ticked the wrong box. But it does seem to have worked well and I will do this in future on 2-parters if I remember. Rob, are you aware you can slide the footrest? See the second photo in part 1 for evidence. When will it end?, has date been given?